Born from Alessia Santi's desire to establish herself without becoming a slave to fashion, Manila Grace has been championing natural fibers, unique prints and quality since its inception. Continually focusing on overlaps, fabric blending and asymmetries, the Italian label cleverly mixes an urban cool aesthetic with casual elegance and un unerring eye for detail. 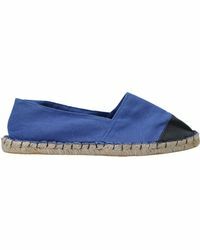 As stylish as they are practical, Manila Grace flats, sandals, espadrilles and pumps are a welcome change from vertiginous forms. Expertly refreshed by bright hues, prints, adornments and innovative cuts, this range is both bold and unassuming.